Depth of concealment . . . not. "Within this blurry focus, however, some colors are better perceived than others.lue, violet, and near ultraviolet light are seen more clearly by [whitetail] deer than other colors. Near sunrise and sunset, blue and UV makes up much of the light available, and that's what deer see better than other colors. So keep those jeans at home, boy." And if you say that you have shot plenty of deer and elk while wearing blue jeans, well, I have done that too — from a distance. 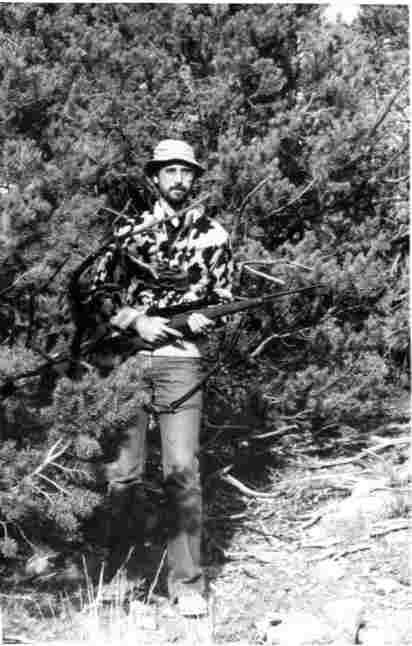 At left, a photo from an old experiment of shooting pictures of hunting clothes in B&W to try to simulate deer vision. The model's camo sweater is black/blaze orange, and shortly after this time, Colorado changed its regs to forbid blaze orange camouflage — you had to have a solid color. He is wearing blue jeans. As I understand, this is all about color-blindness in men, not about deer or elk. If a man is color blind, he can still see the blaze orange as a light color, even better than he could see "safety green," which is right in the center of the human visual spectrum. For a time in my early twenties I sold menswear in a department store, and I was surprised how often a customer would select a shirt, for instance, and then say, "I'm color-blind, so could you pick out a tie to go with this shirt for me?" Edges of reflective hat band catch your eye. Yet some say that color-blindness has evolutionary value, giving those men affected a sort of predator-type vision, an ability to spot movement against jumbled backgrounds. • "Behavioral measure of the light-adapted visual sensitivity of white-tailed deer" (abstract only). • Camopedia: The Camouflage Encyclopedia. • Kamouflage.net, another compendium of military camouflage from around the world. • "Portraits, Cubists, and Camouflage" — how pre-World War One artists influenced military camouflage design. • The U.S. Army's ongoing camouflage controversy. 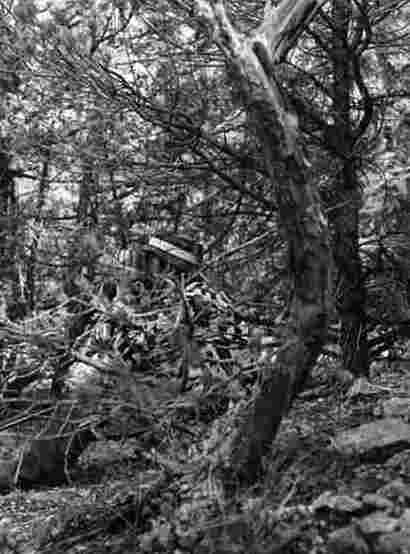 • A history of digital camouflage development, focused on the United States and Canada. You are right about the unnaturalness of straight lines. We should have tried it after putting black blobs of ink on the orange band, perhaps.